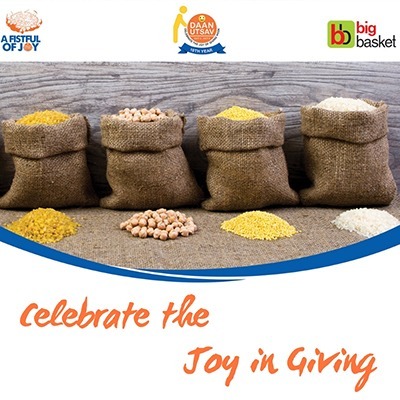 Big Basket aims to engage 4,000 school children in A Fistful of Joy campaign during Daan Utsav – India’s festival of Giving (Oct 2-8) at Lucknow. Big Basket will provide each student with a bag and a homework note with instructions which they take home and every day of the DaanUtsav Week (2nd to 8th October) before they have lunch/ dinner, the child puts a fistful of rice (or dal) into the bag. The bag is brought back to school on a designated day and is given to an organisation of school’s choice. Big Basket will match upto 1000kgs (1 tonne) of total collection.